Measuring just 1.5 to 1.9 m in length and weighing between 45 and 85 kg, the harbour porpoise (Phocoena phocoena) is the smallest cetacean in British waters. It has a short, rotund body, with a blunt snout and no obvious beak. The dorsal fin is small and triangular in shape, and there is a slight dorsal ridge extending back from the fin to the tail flukes. Colouration is variable, but the species has a typically dark grey head and jaws, wth a pale throat and ventral surface and a dark back and flanks. In adults, there is often a striking grey line from just below the eyes to the anterior insertion of the flipper. The flippers, tail flukes and dorsal fins are all dark grey to blackish in colour. Harbour porpoises are usually seen in small groups of less than ten animals, although larger aggregations of up to 50 individuals can sometimes be seen. The swimming motion is usually inconspicuous – involving surfacing with a rolling motion – although the animals occasionally surface with a vigorous vertical motion, causing a splash. The characteristic unobtrusive respiration sequence and small size of this animal makes it difficult to observe in all but the calmest of sea conditions. Moreover, the species is notoriously shy and generally avoids approaching boats. The harbour porpoise is found in cold temperate and sub-arctic waters of the Northern Hemisphere, commonly inhabiting shallow coastal bays, estuaries and tidal channels of the Atlantic coast of Europe, east and west coasts of North America and the Pacific coast of Asia. The species is currently abundant in the central and northern North Sea and continental shelf west of the British Isles. However, it has now virtually disappeared from the Baltic, and the winter migration which it once undertook from the Baltic to the North Sea has ceased. The species is still regularly seen in the Danish Wadden Sea and particularly in the northern North Sea, west of the Orkney and Shetland Islands, in north-west Scotland, western Ireland and along the Welsh coast. Most sightings occur on the continental shelf within 10 km of the coast, and typically in water less than 100 metres in depth. Although harbour porpoises do not seem to make long migrations, they do undertake seasonal movements related to food availability: generally inshore in summer and offshore in winter, but sometimes also north in summer and south in winter. In northern Scotland and in Danish coastal waters, the species is present year-round. In the Black Sea, North Atlantic and North Pacific, however, populations have become semi-isolated and have subsequently been proposed as separate sub-species. Harbour porpoises reach sexual maturity at an age of 3 to 6 years, and at body lengths of about 1.35 metre in males and 1.45 metres in females. Mating occurs in the summer and the gestation period is one year or less. Subsequently births are typically in summer, and have been recorded between May and August (with a strong peak in June) around the British Isles. The period of lactation is uncertain, but it is thought to occur for around 8 months as females calve every 1 to 2 years. These phocoenids appear to feed upon a variety of fish and cephalopod species; the diet varying with location and availability of prey items accordingly. Prey species may include herring, mackerel, sprat, pollack, hake, sardines, sandeel, squid, octopus, crustaceans, molluscs and even polychaete worms. 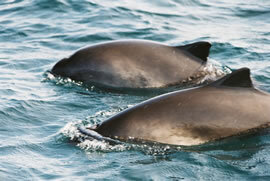 Studies of harbour porpoises in Scotland and west Wales have indicated that foraging is closely related to tidal cycle. It is suggested that pelagic shoaling fish (such as sandeels, whiting and herring) become concentrated in the tidal race and that the channels are used by the porpoises to herd and catch these prey items. The species usually hunts alone or in small groups, but may form loose aggregations if there is a large amount of food (despite still tending to feed semi-independently). Because of its large surface area to mass ratio, the dimunitive harbour porpoise must consume up to 10% of its body weight per day to survive in the cold temperate waters of the North Sea. Large aggregations of harbour porpoises are usually related to feeding or seasonal movements, and often comprise a number of small, cohesive pods, spread over a wide area. There may be some sexual segregation, possibly of females travelling singly with their young while males associate in schools. Immature animals of both sexes may also form separate groups. Play is not frequently observed, but there are documented cases of porpoises picking up objects such as starfish or seaweed and carrying these in mid-water for hours at a time, balancing them on their flukes or flippers. They occasionally breach, possibly during intense foraging periods and in a social context, and have been observed leaping over one another and performing tail slaps when socialising. Feeding schools are often associated with seabirds.